« New Hollis dive gear in store ! 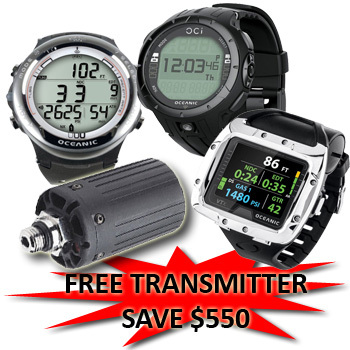 We are offering free transmitters with all range of Oceanic wireless air integrated computers. Air integrated computers not only tell you how much air you have left in your cylinders, but also how long it will last based on your depth and work rate. They also add a great safety benefit by providing audible and visual (flashing red light) alarms when the tank reaches a preset pressure.